Log in for our 10th anniversary gifts to you! 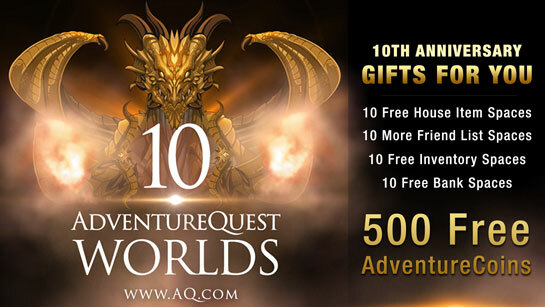 This Friday, we begin AdventureQuest Worlds' BIGGEST anniversary celebration ever. Log in and head to Battleontown to /party with all your favorite NPCs and friends from across our game universe. Note: accounts must have logged in within the last 6 months to get the free spaces.